So back to the spices! I have a cabinet that I keep them in. I am short. My cabinets are not. So I can only see the bottom shelf and honestly probably the first 3 rows of spices in the bottom shelf. SO there is a lot of taking out and moving around when I am cooking and baking. Same with my sprinkles and extracts when I am baking. She used a clear shoe organizer on her pantry door. I am sort of in love with this idea. And I have a double door pantry, so I could use one side for spices and the other for sprinkles. The only thing I am worried about is that my pantry isn't close to my stove. I love having all my spices right there. Because I can never plan ahead enough to actually GET the spices OUT before I start cooking. Where are your spices in your kitchen? neat idea for the kitchen! i read on another blog that she used the shoe holder for stuff that her husband carries in and leaves on the kitchen island. She hung it on the door to the coat closet. We have very limited cupboard space. I brainstormed and ended up doing this same thing and it has worked out great! 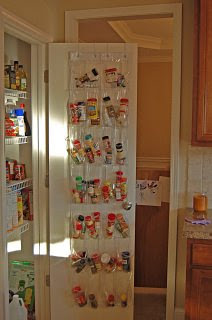 I have this fabulous, really skinny pull out right next to the stove/oven that holds most of my spices. The rest that are in odd sized containers are in a cupboard to the right. Shoe organizer idea is great! Now that is pretty smart! I dont cook much, so only have about 12 spices in there, and I just throw them in and slam the door. 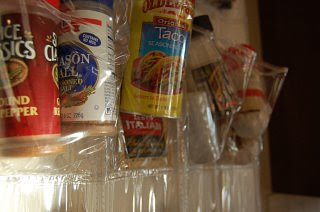 I have a spice cabinet, but this is a brilliant idea too! I have seen that idea before & love it but it's not practical for me unless I hang it behind the door of the laundry room. Right now I have mine in the cabinet next to the stove. They are on the 3 tier little wooden platforms. I buy the small spices whenever possible so I go through them faster. This would be wonderful if we had a full pantry door! My kitchen is petite, so the spices are simply in the cabinet closest to the stove. And I need to *toss* most of my spices. They is/are bad. :-) I don't think I need as many as I have. At the end of the day, I use like 5 regularly. Maybe?? Plus I've started using fresh a lot more (just hard to get my paws on the cold winter). Oh love that owl cake..your friend must be a pro at baking cakes and selling them...I would buy one...awesome cake!